Making Flour from the roots of a bulrush. Bet you didn't know that making flour is as easy as grinding a dried bulrush to a pulp and then grinding that into a powder! 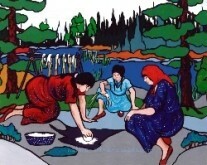 That's me in the light blue dress watching my mother grind the dried bulrush root into flour. She started by hanging the bulrush up to thoroughly dry out. Hot, dry weather is obviously best for that part of the process. The she cut the very dry root into small pieces and dumped the bits into a shallow hollow in the rock...lots of that around on the Canadian Shield. Then my mother pounded the pieces with a heavy round rock until they were small enough for grinding. For that she rolled the same rock over and over the bulrush in order to grind it into a kind of flour. I say "kind of flour" because ground bulrush isn't the type of flour that makes good bread - but it can be used as a thickener in soups and stews or its good to dip fish in before frying over an open fire. Anything you can do with a leek or an onion you can do with the white stalk of the bulrush. It doesn't taste like a leek or an onion but if there's no store close at hand you make use of what you've got. The bulbous root....if you wash it thoroughly...can be eaten raw, too. It doesn't taste like one, but it has a texture somewhat like a cucumber. You can even eat the cattail if you harvest it when it's very young... like the baby corn cobs served in Chinese restaurants. Slice the hard brown cattail very thin and saute gently in butter. They have a mild, almost nutty flavour... mmmmm. The real bit of news is that a bulrush has twelve times more Vitamin C than an orange. So now that you know this you won't have to pay big bucks for imported oranges from California and Florida. Just stop the car beside a ditch and harvest your own vitamin C...you won't even have to worry about pollutants because the bulrush plant can somehow filter and dispose of all sorts of yucky stuff...even mercury according to some studies.